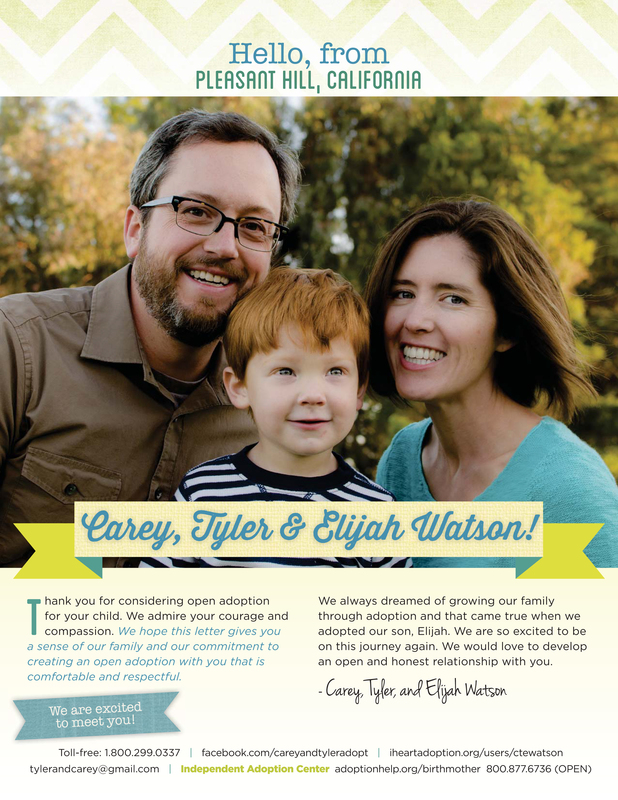 In 2014 Carey and I decided through much prayer and deliberation to adopt another child. Adopting our son Elijah was one of the greatest experiences of our lives. We knew we wanted to grow our family and after being unable to conceive, we returned to adoption rather than pursue medical treatments. We chose Independent Adoption Center (IAC) again because we had a wonderful experience with them last time, and I am not referring to the fact we waited an outrageously short five weeks to adopt Elijah. Rather, the more we worked with the staff of IAC, the more impressed we became with their thoughtful services and professionalism. Also, because we adopted through IAC before, we would not have to jump through so many hoops this time. Make no mistake, there were still plenty of hoops—reams of paperwork and interviews and home visits from social workers. We created a new Dear Birthmother letter, which would introduce our family to pregnant women considering adoption. Making our new letter took longer than last time and that frustrated us. We were anxious to go into circulation, which was IAC’s way of saying we completed all the requirements and were ready to adopt. Our adoption coordinator told us the average wait for families in circulation was fourteen months. She said in her experience families who already had children, like ours, waited longer. Though a prototypical adoption does not exist, we knew because of our extraordinarily short wait last time, we did not share many of the experiences common to other adoptive families. We did not know the euphoria of matching with a birthmother before the birth, seeing ultrasounds, taking our time picking a name, or nesting. Nor did we know the frustrations of months of silence, scam phone calls, and matches with birthmothers that fell through. We had internal work to do to prepare ourselves. For Carey, she had to convince herself that we would have a long wait. It was easier for me with my natural pessimism to expect this adoption would take over a year. But because of our previous experience, I had to prepare myself for the chance that we might adopt another child at any minute. We completed our iheartadoption profile and made a Facebook page. IAC possessed copies of our Dear Birthmother letter waiting to go to pregnant women. Our toll-free number stood ready to receive calls. We had a new adoption-specific e-mail address. On February 10, 2015 we publicly announced we were available to adopt. Friends and family spread the word. A wave of encouragement washed over us. Dozens of likes and shares on Facebook. People promised to pray for us. After about a week, the excitement subsided. We settled into the wait. One March afternoon, four weeks after going into circulation, we received a call from IAC about a last-minute placement. The setting of the phone call struck us as odd—Carey was home for lunch, which almost never happened. We wondered if God was up to something and we were about to break our five-week record. The birthmother, however, chose another family. The experience revealed we were not entirely prepared for a last-minute placement since we did own a car seat. I promptly went out that afternoon and bought one at a discount—it was a floor model. Then we entered the silence. Over the next few months our phone never rang. Our e-mail inbox sat empty. IAC told us they sent out several copies of our letters to birthmothers each month, but we didn’t see anything come of it. In attempts to lighten the mood, we quoted Homer Simpson’s line about the waiting game over and over. We wanted to do something more proactive. We posted videos of our family online. Carey drafted a letter to her ob/gyn colleagues in other practices and to my pastor friends, asking them to direct women considering adoption to our agency. The silence brought about two extreme reactions in me. Some days I could think only about the new child. Who would she be? What ethnicity? Where would he be born? The adoption consumed me. Other days the adoption didn’t seem like a reality at all and I had to consciously remind myself our family of three would actually expand. In April our friends gave us their car seat they would no longer need. We decided to return the one I bought, but I procrastinated and it sat in our garage. On the afternoon of June 19 I finally got around to returning the car seat we purchased all those months ago. Refund in hand, I went home to prepare dinner for my family and friends. As we ate dinner I looked down at my phone—usually a taboo at our table—when an alert notified me an e-mail came to our adoption address. I read a message from a birthmother who was 31 weeks pregnant with twin girls. She liked our profile. She wanted to place the girls in a stable Christian home to parents committed to an open adoption. The birthmother thought we could provide these things and invited us to call her. My heart leapt into my throat, but I turned off my phone and didn’t say a word. After clearing our plates, we went on a sunset walk with our friends in the park behind our home. I handed Carey my phone and said, “You’ll want to read this.” She read the e-mail, shocked both at the message and that I could sit on it throughout the dinner. We told our friends the crazy news. They were like us, excited and nonplussed. My mind turned to logistics. We did not own a vehicle that could seat a family of five. I thought, twins means an immediate minivan. And remember, I just returned a car seat that afternoon because we thought it was superfluous. Now we were one car seat short and had to purchase another one with no guarantee that we would get a similar discount. But I was getting ahead of myself. We still had not spoken with this birthmother, let alone matched for an adoption, so I told my brain to shut up. Shut up and pray God would make it clear if this was an adoption we should pursue. Beautiful! Can’t wait for the next installments!